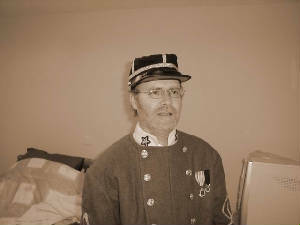 54 year old John Collier is the Camp Commander , able to trace his ancestry back almost 2,000 years generation by generation John fully understands and appreciates the importance of our heritage and our past. John is one of the lapsed members recruited by Adjutant Jerry Wells , when Jerry initiated the forming of the Camp.. Even though John is the Camp Commander , a position he considers a great honour he would be the first to tell you that Bob and Neville are very much the footsoldiers of the Camp this side of the Ocean, with Jerry being the man who makes the Camp run as well as it does. If there is an admin duty or if the IHQ need to be contacted or if there is any SCV business that needs urgent attention , Jerry is the man John calls on to get the job done ! John lives with his wife Barb and step son Andrew in Scarborough with his dawgs . John's family being in the same county since at least 1440. A supporter of Confederate Heritage since the age of 8, John is very proud to be the first Commander of an SCV Camp in Britain.